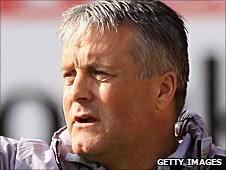 Micky Adams has signed a three-year deal to return as manager of Port Vale. The announcement marks a quick return to the Valiants for Adams, who had spent 18 months in charge at Vale Park before joining his boyhood club Sheffield United in December. Adams said of his January switch: "I let my heart rule my head. "I have followed Vale's fortunes closely since I left and no-one is more disappointed than me that the club did not achieve promotion this season." Vale finished the season 11th in the League Two table, closing the season with a limp defeat at relegation-threatened Barnet to end three points behind the last play-off berth. Adams' switch to the Blades did not work out as planned. He led them to just four wins in 24 matches as they were relegated from the Championship. Sheffield United sacked their boss of five months on Wednesday. Chairman Bill Bratt said: "Micky made a tremendous impact during his last spell at Vale Park and his positive presence has been missed. I am delighted to welcome him back to Port Vale. "When we learned that Micky had become available, it was clear that he was our preferred candidate. "I have always found Micky to be an honest and up-front character and although I am disappointed for him personally that things did not work out at Sheffield United, their loss is most definitely our gain." Vale's season went downhill after Adams' departure. Former Stockport boss Jim Gannon replaced him but lasted only 75 days before being sacked, making him the shortest reigning manager in the club's history. Youth-team coach Mark Grew and ex-Fulham, Birmingham and West Brom striker Geoff Horsfield took over in a caretaker capacity but they could not provide the sparkle needed in the quest for promotion. Defenders Gareth Owen and Adam Yates, plus midfielder Doug Loft, have signed two-year deals, while a new coaching structure is expected to be unveiled in due course. Owen, who almost left Vale for neighbours Crewe prior to Adams' return, told BBC Radio Stoke: "I was amazed because I didn't think he would leave Sheffield United and I didn't think that he would be appointed as Port Vale manager so soon. "I think everyone is thankful that he is back and we've got some unfinished business to attend to." The 28-year-old has also been appointed Vale's reserve team coach.